Before seeing the reaction on social media to his Blue Planet II documentary and then watching it myself and seeing all sorts of other awareness articles and more pop up around the same time, I honestly didn’t have a clue just how bad the plastic problem was or how long a single piece of plastic stuck around. Let alone the awful problems that it can cause for the environment and wildlife. Like so many people in the country – a massive amount considering the 53% drop – I’ve tried hard since then to reduce the amount of single use plastics I use and in fact plastics full stop unless they’re something that I know will last for a very long time and be used a lot. I wrote a post a while ago about alternatives to plastic and I try to implement lots of them myself. I know that we as a family could still do better, but I do think that a certain amount of the responsibility lies with the manufacturers too, to find alternatives for their packaging and stop over-packaging things to a ridiculous degree. That 53% drop in single use plastics is just amazing though and it bodes well for the future too I think, with so many more people making small changes that as a collective have such a huge effect for the World we live in. Other heartening things include how much more popular and widespread doing beach cleans are, thanks partly to wonderful people like Martin Dorey and Tab Parr who set up #2minutebeachclean. 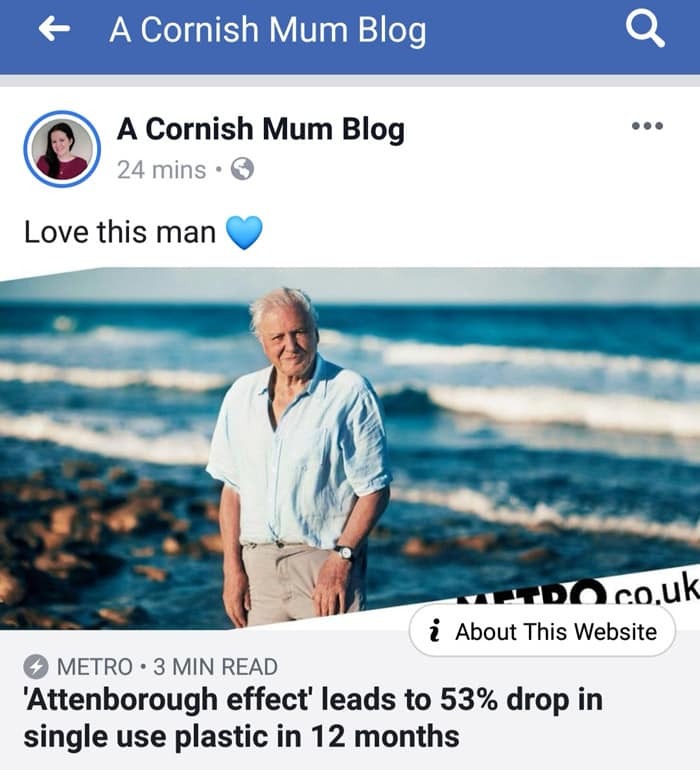 I met Martin at a blog conference several years ago and he’s a lovely bloke doing a really great job of encouraging people to look after beaches around the UK. Plus the number of ReFill shops popping up around the UK further minimising the amount of packaging wasted with everyday items is great. Anyway back to David Attenborough, to finish off this post, I just have to say the man is a legend. I love watching his documentaries, we’ve watched a few in homeschool as I figure they’re educational as well – though mostly as I enjoy them in all honesty. Oh I totally agree, the man is a legend. Although, every time I see he’s trending on social media I panic that he’s dead. Seriously, the man is in his 90’s and I have literally no clue how the world will cope without him.